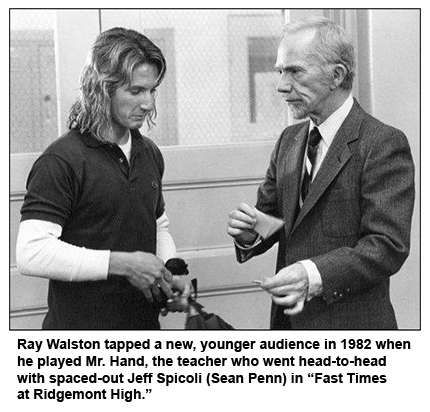 Ray Walston was a scene-stealing actor who was able to make a silk purse out of a sow's ear. When performing in a good film or television show, Walston was very, very good. When stuck in a piece of junk, Walston still was very, very good. I met him in the fall of 1963 when he went to Washington, D.C., as part of a CBS promotional tour. Walston was about to debut as the title character in "My Favorite Martian," with Bill Bixby. Among the other actors who participated in Washington, I can recall only two, E. G. Marshall and Robert Reed, from "The Defenders." I attended the event with a group from the Cleveland CBS affiliate, WJW. Walston would be well rewarded. "My Favorite Martian" ran for three seasons and made him a household name. My first exposure to Walston was "Kiss Them For Me," a dreadful 1957 movie comedy, one of the worst things Cary Grant ever made. Jayne Mansfield and model-turned actress Suzy Parker were in it. I won't say Walston made the film bearable– nobody could have done that – but I did enjoy his performance. Later I saw him in "South Pacific," "Damn Yankees" and "That Apartment." 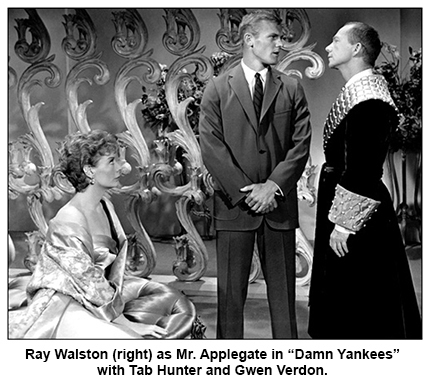 He was especially good as Mr. Applegate, the devil, in "Damn Yankees," though I wish someone other than Tab Hunter had played the lead role. From 1959 until 1963 Walston showed up mostly in television guest roles. I can't say for sure while he wasn't doing movies, though my hunch it had to do with the trend away from musicals and toward filming on location. Walston wanted to stay close to his family; working on television enabled him to do that. He was featured in occasional movies – "Caprice" (1967), "Paint Your Wagon" (1969), "The Sting" (1973), "Silver Streak" (1976), and the one most people remember, "Fast Times at Ridgemont High" (1982) in which he played teacher Mr. Hand. But most of his work done on television, including a short-lived series, "Fast Times" (1986), in which he again played Mr. Hand. However, his biggest success may have been on "Picket Fences" (1992-96), as cantankerous, but always fair Judge Henry Bone, a role that earned him two Emmys as best supporting actor. WASHINGTON – I have no way of knowing for sure – certainly he’d never admit it in an interview – but Ray Walston doesn’t strike me as the type who’d want to do a TV series ... this or any other year. Walston recently was part of a whirlwind CBS publicity tour and he stood out from the other network personalities like a sore thumb – and I mean sore. Claiming he was tired, Walston was noticeably less enthusiastic about his new venture than his traveling companions who were bubbly about everything. Walston just said he had a series and hoped people would like it. So why did he go into television? He answered that one like a politician ... which means he gave no answer at all. Money seems the obvious reason, especially since Walston has part ownership in “My Favorite Martian.” The series might also be the best offer the actor has received lately. Walston also is a family man and says he and his family have grown to love their California home. A television series guarantees he’ll stay in California and do it in the manner to which the Walstons have cheerfully become accustomed. Like other unsung supporting actors, Walston also hopes a television series will establish his identity with a nationwide audience. In recent years Walston has suffered a fate that too often befalls actors who are too good in certain roles. Walston’s undoing was his memorable performance as Applegate, the devil, in the stage and screen versions of “Damn Yankees.” Since then he has been flooded with offers to play other devils, but turned them down. Now he has jumped from hell into the heavens to play a visiting Martian, which shows how his resistance broke down. I don’t know about you, but to me there is a strong similarity between someone from down below and someone from out in space. They’re usually pixies by different names. It’s too early to know how successful “My Favorite Martian” will be, but my hunch is the series will never completely do Walston justice, which is a shame because the guy is very good. Because of its early timeslot, “Martian” may be labeled a kids’ show, and because its central character is a Martian, the program might well be ridiculed by critics. Walston is aware if the pitfalls and has rationalized the situation well. “As an ex-newspaperman and critic, I can appreciate playing the role of a Martian,” he said. “Critics have a wonderful time expertising on performances of actors playing mere Earthlings, particularly by actors who play the roles of newspapermen. “But what can a critic say about a guy playing a Martian? What standard of critical evaluation does he have? Oh, it isn’t hard to find descriptions of men from Mars in popular fiction, but it’s another matter finding any two fantasy writers who agree on what a Martian is really like. And how many critics do you know who are Martians themselves? “So if I come from Mars to Earth in a spaceship, who’s going to quibble about my method? And if, as a Martian, I leave no fingerprints on anything I touch, can you argue? I saw Martian have no fingerprints. “If I come to Earth on a purely peaceful mission, can anyone argue it is unrealistic, claiming that all Martians are warmongers? “When I cause inanimate objects to move through the sheer strength of my will, I do it because all Martians are practicing telekinesists. Walston has been in show business more than 20 years, but is regarded as a late bloomer. He was born 43 years ago in New Orleans. He quit school during the Depression and got a job as a printer at the New Orleans Item-Tribune making $8 a week. Later he got a better-paying job – was there any worse? – as a linotype operator in Houston. He saw a play one night and became fascinated with the idea of acting. He moved to Cleveland in 1943 to work with director Margo Jones at the Cleveland Playhouse. He remained there 30 months before deciding he was ready for Broadway. Then Hollywood called ... and Walston leaped at the offer. He should have looked before he leaped, because his first movie – “Kiss Them For Me” – was a disaster. Walston’s pride suffered only minor wounds because most of the blame for the film fell on the three stars – Cary Grant, Jayne Mansfield and Suzy Parker. Like others who found gold in California, Walston has gotten used to the good life there. And he has become a fanatic about photography and physical fitness. Photography equipment occupies most of his basement; bar bells and a punching bag take up space in the garage. He begins each day by peddling his bicycle two miles up the mountains near his home. Then he works out in his garage before going to work. Walston also is active in Hollywood’s Theater East, a workshop for actors, writers and directors. He has everything he wants, it seems. A successful TV show will help him keep it.